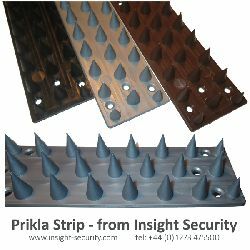 Prikla Anti Climb plastic security spikes deter unwelcome human & animal intruders from climbing into your garden without the risk of harming them. 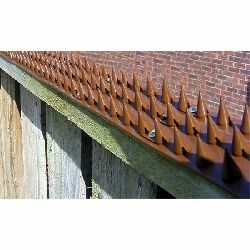 Keep unwelcome intruders (including cats) out of your garden, with these rugged and versatile, simple to install fence top plastic security spikes. 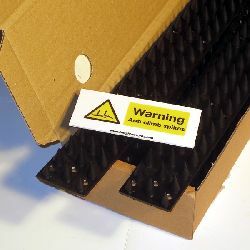 Designed to cause maximum discomfort with minimum harm, our new and improved Prikla45 Strips feature a clever hinged design, which allows them to form easily to either flat or contoured surfaces. 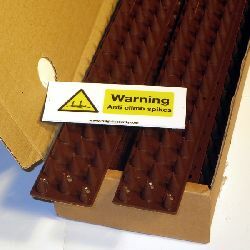 Each Prikla45 strip measures 450 x 45mm with 15mm high spikes and the strips are available from stock in a choice of 3 practical colours (brown, black, or attractive silver grey). Pre-formed fixing holes along the length of each Prikla45 strip allow easy screw fixing into place (the preferred fixing option). However, where screw fixing or nailing is not possible, strips can, as an alternative, be installed using a suitable adhesive. 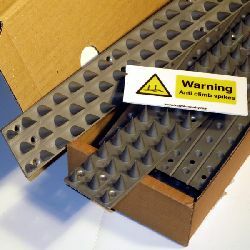 Manufactured from robust, weatherproof polypropylene, these versatile anti climb plastic spike strips can be stuck in position, but you will need to choose an adhesive suitable for use with both polypropylene and the material of the surface to which the strips are to be adhered. Pink Grip adhesive is widely used in the building trade for bonding many types of building materials together and may be suitable for your application. However, it is unsuitable for use on some types of surface such as asphalt covered flat roofs. This Super Value 10 pack covers 4.5 linear metres when the 10 strips (each being 450mm long) are installed end to end. 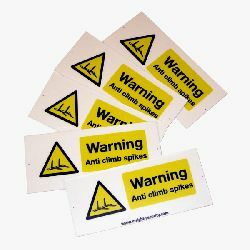 A FREE Warning Sign is included with this pack.